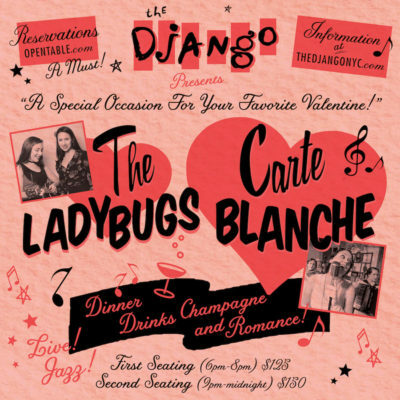 The Django is a notoriously romantic spot for sweethearts to dine, drink and delight in an unforgettable evening of live music entertainment. This makes it the perfect date destination for both sprouting love stories and long lasting darlings on Valentine’s Day! As always, the Django’s performers are world class musicians, making any ordinary evening extraordinary. This year for Valentine’s Day the Django invites you to an even more enchanting event for you and your most special loved one with a prix fixe menu of three courses. We have delicious cocktails on demand, a large selection of champagnes and of course stellar live music to make your holiday most memorable. This event is ticketed only. Table seating is $125 per person for the first seating and $150 per person for the second seating, featuring live jazz and a three-course pre-fixe menu including sparkling wine toast. All tickets are inclusive of gratuity and tax. Reservations are required for table seating and must be made online through OpenTable here.